Discussion in 'Transformers Video Game Discussion' started by Soundwave4win, Jul 17, 2010. Although it isn't a physical map I've made a grid to help organize rooms and help everyone know what side they would like to take when playing a map together. (except for the middle row, which will have 2). It's like geography. find the row I place (letter) and the room I specify (number) and what's inside will be written. the price of items are written next to the item. Nice, I generally stay to the left side of the map, that being left of where you spawn in. Does anyone know wether Overshields are rechargeable via the repair ray or not? They are not. However they do refill your health to mx if you pick one up in addition to the sheild. Some good stuff here. I mostly play the Autobot stage and only the Cons a few times. I like using Soundwave and Shockwave. How about you guys? The repair ray only refills heath blocks, not the oversheild bar. @Split Lip: Thanks for clearing that up, my mistake! I see pink Soundwaves and I want to gauge my eyes out. is this helpful enough for everyone? If it might belong in a different thread (tips and tricks) I don't mind if it needs to be placed somewhere else. I put it hear to show everyone my findings. Please do by all means. That list you made was very helpful. I am working on doing some cheesy maps with paint to help out those who are more visual and to help discuss and visualize strategies. This is a first step. Eventually, I want to clean them up well and include all strategical points of defense and expand the size of the maps into larger sections. It should be fun but if its too great of a burden I'll stick to just mapping out weapon stations and doors. Here's my first map. I am quite pleased with how this finally came out. I know for a fact there is a ion displacer vendor in the hall between the right overshield room and the central hall of the level. If anyone needs heavy turret firepower, there ya go. And is there a fusion cannon anywhere for Megatron to buy? On the rare occasions I do play him (only when Starscream is taken), it feels weird playing as Megatron without his most potent weapon. Nice map! Very well done! The general strategy when I play with friends is to open up the left side (side A) all the way up to the scrapmaker room (A4 but DO NOT OPEN THE DOOR TO THE OVERSHIELD ROOM BEHIND IT!!! ), defend and camp there until we accumulate enough points to open up the entire right side (side B all the way to the Overshield room). Once side B is fully open, we grab heal grenades, overshields, ammo and EMP grenades between waves and head back to the A4 area (the scrapmaker room on the left side). It's an ideal room to defend and camp since you have access to ammo and thermo mines (for taking out any unwanted guests dropping in the room). With 3-4 frag launchers raining grenades, you can pretty much clear 80% of the enemies coming up the stairs before they even reach to the room. Opening doors and arming everyone with a Frag launcher as soon as possible at is absolutely crucial. Once the scrapmaker room is open, everyone chips in for the repair ray, then arm themselves with the scrapmaker. The repair ray is assigned to one of the cloakers (cloaker drops the frag launcher or scrapmaker). Once the other side is fully open and you have access to overshields and repair grenades, you can drop the repair ray in favor for another weapon. Basically if there's a group of enemies heading your way, you throw the EMP grenade for the stun, then use Drain, activate Hover and go to town with the scrapmaker. Kill off any remaining enemies with the frag launcher. In most cases this combo will kill off most enemies (it will kill off all in the earlier waves), replenish your health and should net you about 150-300 points for your efforts. For Onslaught you can use the same setup as Megatron. Stun with the EMP grenades, launch the Omega missile, kill anything else still alive the scrapmaker and frag launcher. Nice work on that map. 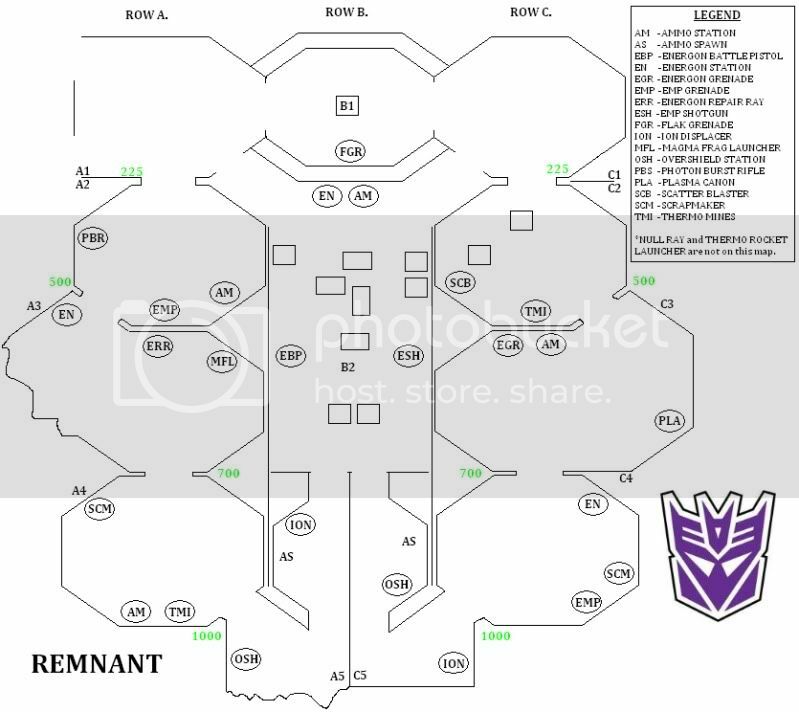 I can't see the pic on the computer I'm on now, what Decepticon map is this for?